A coccyx fracture is a broken tailbone. 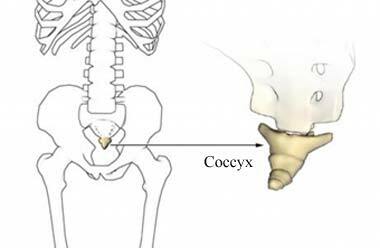 The coccyx is the lowest part of the backbone or spine. It is small and shaped like a triangle. The bone curves gently from the end of the spine into the pelvis. Fractures may may also occur during straining or friction, such as with rowing or bike riding. You will be asked about your symptoms and how the injury occurred. A physical exam will be done. The exam may include a rectal exam. If the coccyx is fractured, your doctor may feel abnormal movement of the coccyx. You will experience pain. X-rays may or may not be needed. The goal is to manage pain until the bone can heal. The location of the coccyx and the number of muscles attached to it makes it difficult to prevent it from moving while it is healing. Generally, pain will go away on its own. The area may remain painful for a long period of time, even after the fracture has healed. Bed rest may be needed for a day or two, or moving only as comfort allows. Stool softeners may also be needed to help prevent constipation or pain during bowel movements. Surgery for a painful coccyx fracture is rare and not very successful. If pain continues and causes disability, a coccygectomy might be recommended. During this procedure, the doctor removes the coccyx. Build strong muscles to prevent falls. Acute low back pain. EBSCO DynaMed Plus website. Available at: https://www.dynamed.com/topics/dmp~AN~T114958/Acute-low-back-pain . Updated May 15, 2017. Accessed August 24, 2017. Fractured coccyx. Cure Back Pain website. Available at: http://www.cure-back-pain.org/fractured-coccyx.html. Accessed August 24, 2017. Low back pain. Ortho Info—American Academy of Orthopaedic Surgeons website. Available at: http://orthoinfo.aaos.org/topic.cfm?topic=A00311. Updated December 2013. Accessed August 24, 2017. Spinal cord injury—acute management. EBSCO DynaMed Plus website. Available at: https://www.dynamed.com/topics/dmp~AN~T114275/Spinal-cord-injury-acute-management . Updated June 15, 2017. Accessed August 24, 2017.